Let is snow, let it snow, but only pretty snowflakes. Sharing these pretty snowflakes from the Frantic Stamper Winter Wonderland release. For this card I made some ink puddles of a few blues and dragged the snowflakes through it, so some have heavier ink than others. 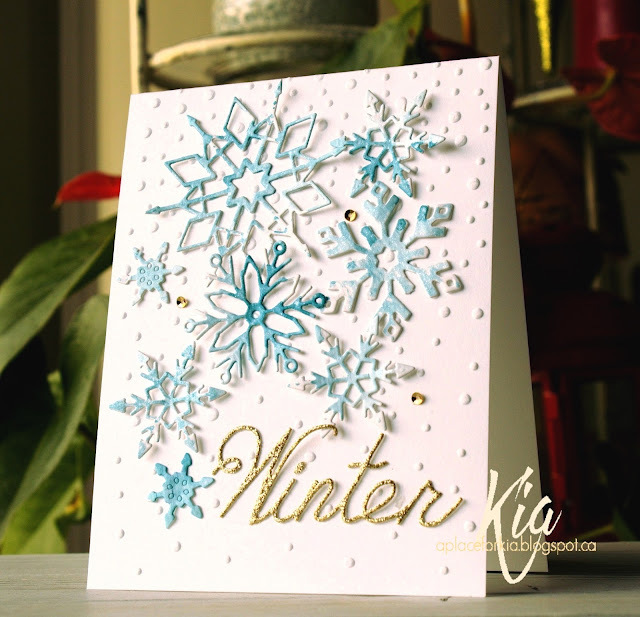 I then added Wink of Stella to all the snowflakes and arranged them on my card base which I embossed with the falling snow embossing folder. Once I was happy I attached them with glossy accents to make sure they stayed in place. I die cut the sentiment from gold glitter paper, I love the glam of the gold with the blues. And, a day without sequins is like a day without ... well snow! Thanks for dropping by today. Products: Frantic Stamper Crystal Snowflake, Snowflake Trio, Snowflakes cut from Let It Snow Oval; Frantic Stamper Winter sentiment, Sizzix Snow Dots Embossing Folder, Cupped Sequins, Glitter Paper, Watercolor Paper, Tim Holtz Distress Inks, Wink of Stella. Sharing Warm Wishes with you, which is a card I did for the latest release by Frantic Stamper, which is called Winter Wonderland. If I had a pair of skates like this I might give it a try again! I did a watercolour wash for the background using Tim Holtz Distress Inks. I cut the beautiful Frosty Snowflake and painted with Wink of Stella Brush then added a dot of glossy accents to attach the Hanging Skates securely, which allows the skates to hang freely. 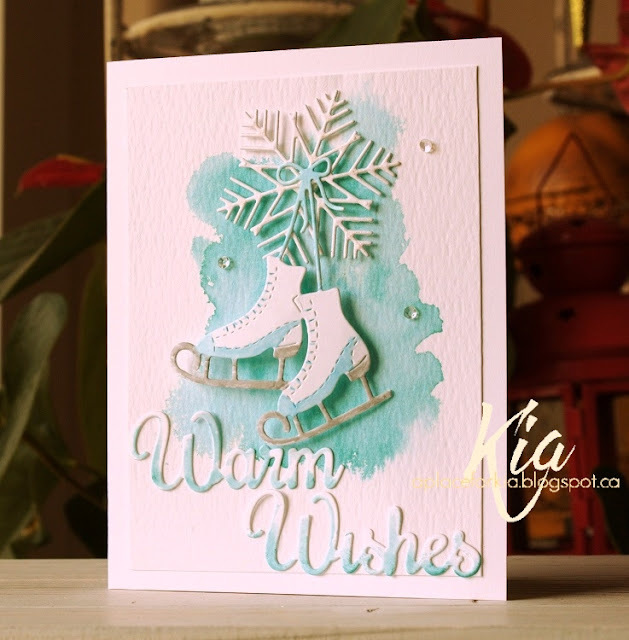 I added the Warm Wishes sentiment which I painted lightly with my Zig brushes in the turquoise, which I also painted the skates with. I added a few cupped sequins to finish. Products: Frantic Stamper Dies; Ranger Watercolor Paper; Tim Holtz Distress Inks Evergreen Bough; Zig Brushes, Neenah Cardstock. Give thanks I designed for Frantic Stamper as part of their latest release called Winter Wonderland. 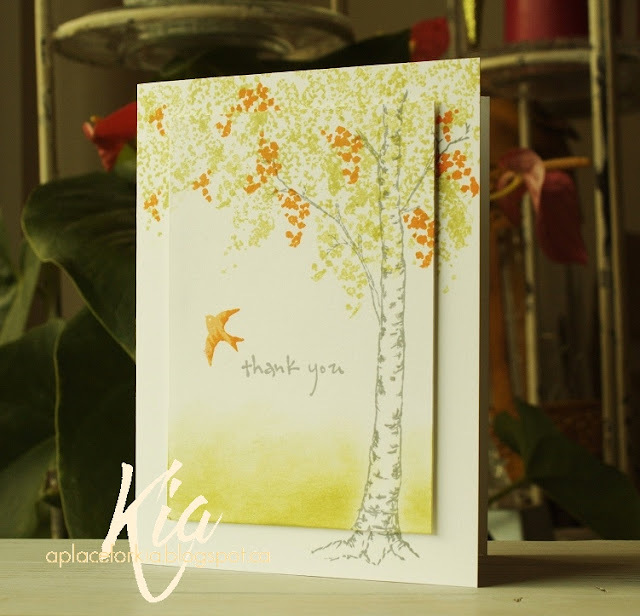 I love the birch tree shapes which I used on my card base as well as embossed on the tag. The cute little squirrel is part of the Birch Tree Forest Set, which also has a couple of bunnies and birds included in the set. In keeping with a clean look I added a neutral twine and a small sentiment, stamped to match the collar of the tag and attached the tag on foam strips. Products: Frantic Stamper Birch Tree Forest Set and Tag Builder Set; Sugarloaf Phrases Collection Stamp; Twine, Tim Holtz Weathered Wood, Zig Brush. Good morning to you. This is Autumn Leaves, which I did for Art Neko. 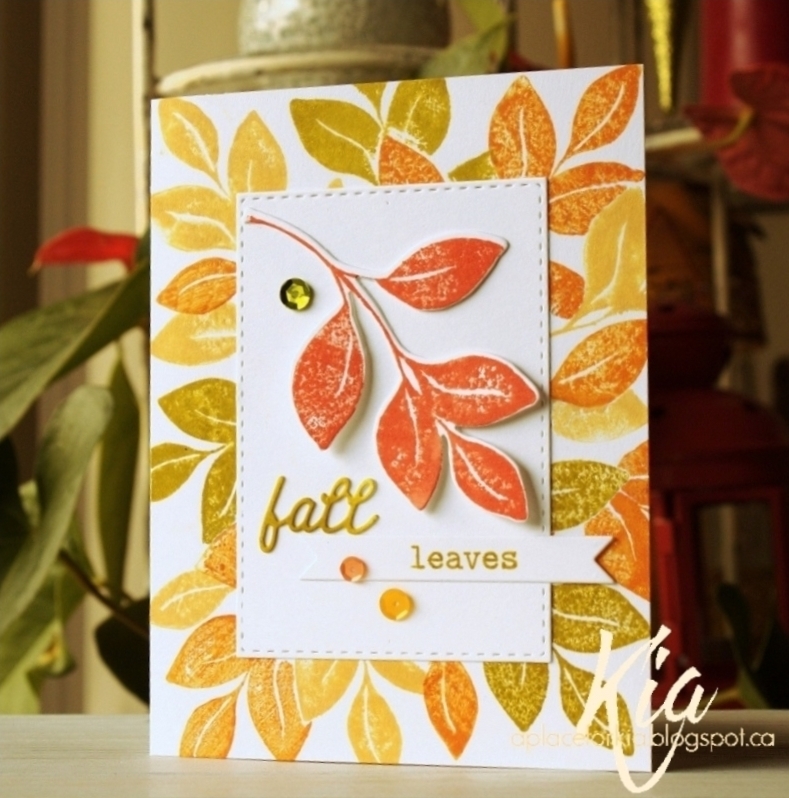 I think this stamp which is called Leafy Background, displays perfectly the beauty of the ever changing autumn leaves. I first die cut my paper with the stitched rectangles then used my MISTI to assist me in centering my stamp on my watercolour paper so I would have a nice clean border, and stamped using Tim Holtz Seedless Preserves and die. I then painted the leaves using various colours of Zig Brushes. For the sentiment, I stamped the Large 4 Seasons Kanji and English using the Seedless Preserves and heat embossed using Clear Embossing Powder on vellum. I then matted using light and darker shades of purple, and added a few sequins in the autumn colours. Thank you for having a look today. 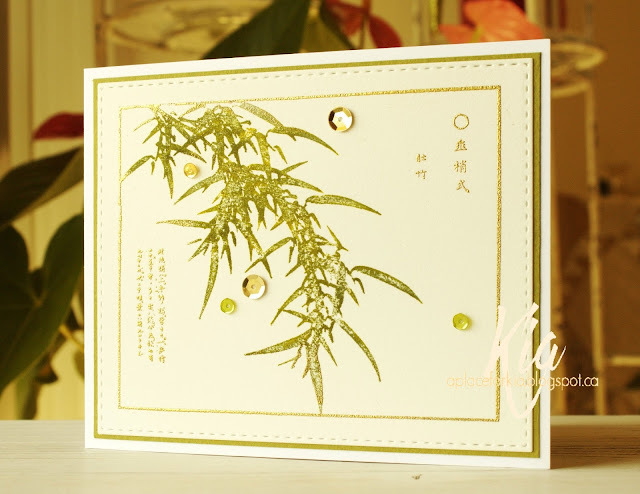 Products: Art Neko Leafy Background Stamp, Art Neko Large 4 Seasons Kanji and English Stamp; Simon Says Stamp Stitched Rectangles; Fabriano Hot Press Watercolour Paper; Neenah Cardstock; Paper Garden Cardstock; 40 lb. Vellum; Sequins. More Autumn to share with you. As I continually say, I love this time of year and all that it brings us. For this card I decided on a roll reversal. Usually the panel would be done with a stamp and coloured. 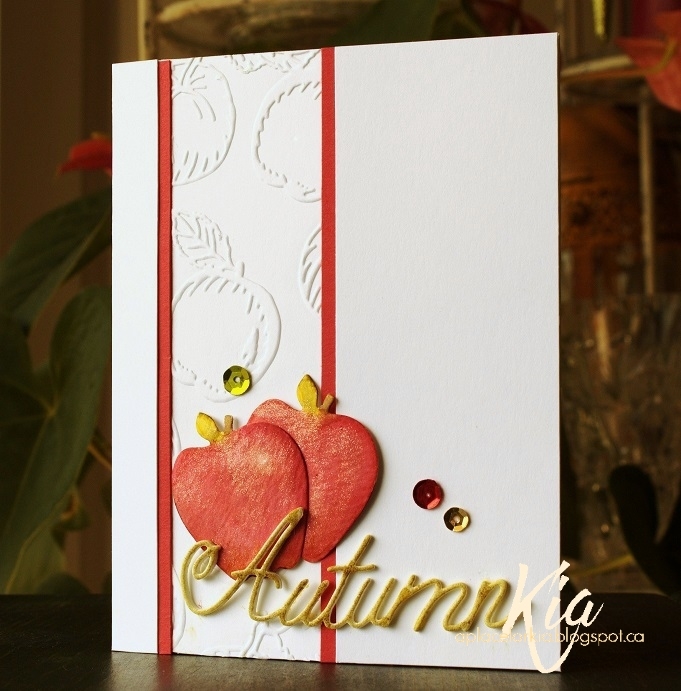 I instead used the panel to highlight my embossing folder and kept my card top plain to highlight the apples, which I coloured using various colours of Zig Brushes. For the Autumn sentiment, I cut it from fun foam and coloured with Tim Holtz Distress Ink Crushed Olive, which is also what I used on the leaves of the apples. To finish the apples I applied Wink of Stella Brush and attached on foam dots. And, to finish my trademark sequins. Thanks so much for visiting today. Products: Spellbinders Assorted Fresh Fruit; Frantic Stamper Autumn Sentiment; Sheena Douglass Little Apples Embossing Folder; Zig Brushes; Tim Holtz Distress Inks Crushed Olive; Wink of Stella Brush; Sequins; Papers: Neenah, Bazzill, Ranger Watercolor; Fun Foam. The fall season is upon us, and I could not be happier. I love this die ... it is one of those that I so enjoy colouring. I did a bold wash with Winsor Newton Sap Green on Hot Press Fabriano watercolour paper for my background, which I had cut using the stitched rectangle die. I cut my pumpkins from Ranger watercolour paper and painted with Zig Brushes. I did the pumpkins first starting with Yellow, Bright Yellow, Orange and finishing with Scarlet Red. For the leaves I used the Yellow and Olive Green, and for the stems I used Oatmeal and Brown, which I also used on the sentiment. I styled the pumpkins and attached on foam dots, adding a few sequins to finish. Thanks for having a look today. 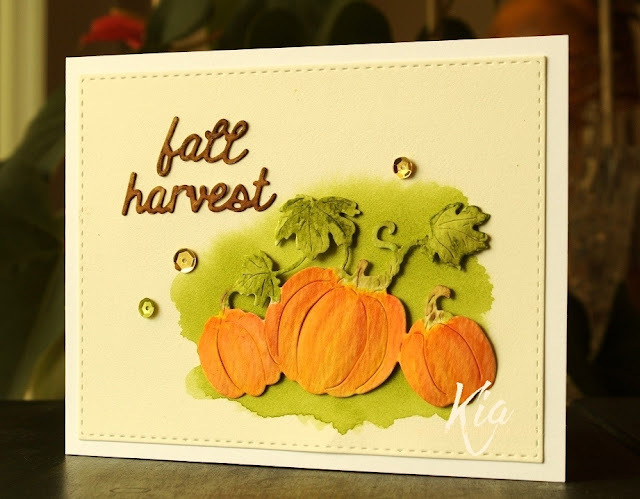 Products: Frantic Stamper Pumpkin Patch, Frantic Stamper Fall Harvest Panel for the sentiment; Simon Says Stamp Stitched Rectangles. 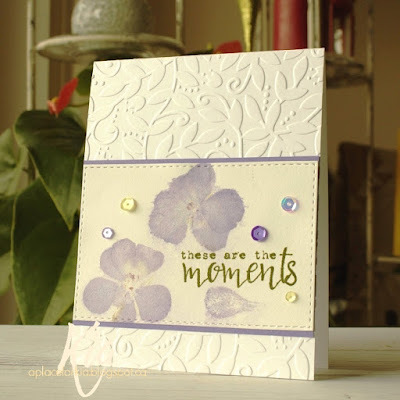 I did this card for the Inspiration Challenge today at SplitcoastStampers. 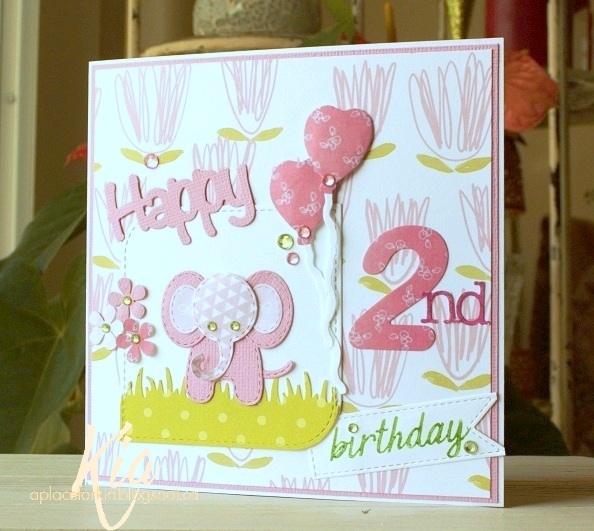 I have a customer who wanted a birthday card for her 2 year old Granddaughter, and I was wondering what to do. As soon as I saw this I started designing. I try to think like a kid, (which is not a stretch for me,) when I am doing birthday cards for kids. What would catch my eye and hold my attention? I think the elephant will, but also the balloons and the big 2 I think will hold her attention for a minute at least! I hope you like this Happy Elephant, and thanks for having a look. Products: Frantic Stamper Happy Happy Happy (I cut the middle happy out), Frantic Stamper Trio of Two's, Frantic Stamper Stitched Petal Labels, Frantic Stamper Fishtail Labels (cut), Frantic Stamper Celebrations Stamp Set; Impression Obsession Elephant, Impression Obsession Heart Balloon, Impression Obsession Typewriter Letters Lower Case; Martha Stewart Grass Border; Misc. Flower Punch, Crystals, Neenah, Bazzill, Pink Petticoat, Bo-Bunny Paper. 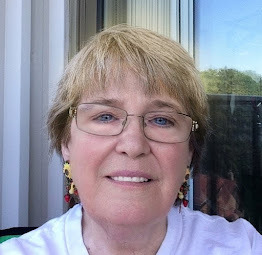 I very much enjoy participating in the challenges at Splitcoast, and the Inspiration Challenge is one of my faves. Today we had a visit to Village Hat Shop for our inspiration, and I picked this Organza Ribbon Hat for my inspiration. I just hosted an Afternoon Tea on Thursday with a wonderful group of ladies that I take watercolour classes with, and the Afternoon Tea's of yesterday with the hats was discussed, but not mandatory - giggles! I mimicked the organza by way of embossing my background panel, and added die cut flourishes cut from vellum to mimic the softness of the flower on the hat. A panel (the ribbon) for my sentiment and sequins and a crystal finished my card. Very fast and simple, but pretty I think. Thanks for having a look today. Products: Anna Griffin Matelasse Embossing Folder, Penny Black Bookmark and Flourishes and Butterflies, Frantic Stamper Celebrations Stamp Set, Simon Says Stamp Stitched Rectangles, Sequins, Crystal, Neenah Cardstock, Simon Says Stamp Intense Black Ink. Sharing Framed Bamboo Poem with Bamboo Leaves from Art Neko. It is a beautiful stamp and from the start I knew I wanted to have different colours for the bamboo and frame. I positioned the stamp in my Misti and stamped the bamboo with Tim Holtz Crushed Olive then spritzed very lightly with water. I did a second ink and spritz as this is watercolour paper. I then cleaned the bamboo area and with my Emboss It Pen I went around the frame and along the text, then heat embossed with gold embossing powder. To add more texture I die cut the frame with a stitched rectangle die and matted with an olive cardstock. A few sequins finished my card, and I am very happy with how it looks. Thanks for having a look today. Products: Art Neko Framed Bamboo Poem with Bamboo Leaves, Simon Says Stamp Stitched Rectangles, Tim Holtz Distress Inks, Fabriano Hot Press Watercolour Paper, Sequins. I enjoyed sitting over tea this morning painting this butterfly. I used my Misti Mini to do the initial stamping by colouring the edges and veins of the butterfly in Orange Marker and spritzing with water before stamping. I then cleaned the stamp and coloured the circles in the bright pink and spritzed with water before stamping. 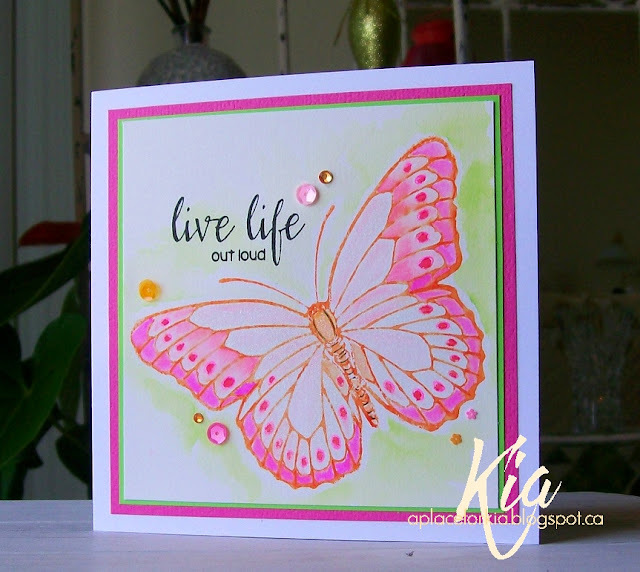 I took the panel out of my Misti and watercoloured with Zig brushes using a light pink wash for the lighter areas and then gradually adding deeper colours as I went down the butterfly. I then did the green wash and let everything dry. I then put it back in my Misti and stamped my sentiment. I put the card together with the matting and then added Wink of Stella to all the light areas of the butterfly. IRL it has a beautiful shine which is very hard to capture in a photograph unfortunately. I finished with my signature sequins. Thanks for having a look today. A Christmas card with a twist, or should I say Ornament! I wanted my ornament to hang over the edge of the page, but I did not want the back of the ornament to show from the inside. I considered stamping and painting the back as well, but the texture would be different, so I opted for another approach. card base. 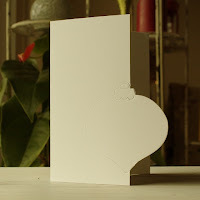 I then embossed the entire card with the evergreen embossing folder. I stamped my ornament on watercolour paper and heat embossed using silver embossing powder, then painted using Zig Brushes. I added the strip of glitter paper along the edge and also cut the Merry from the same paper. 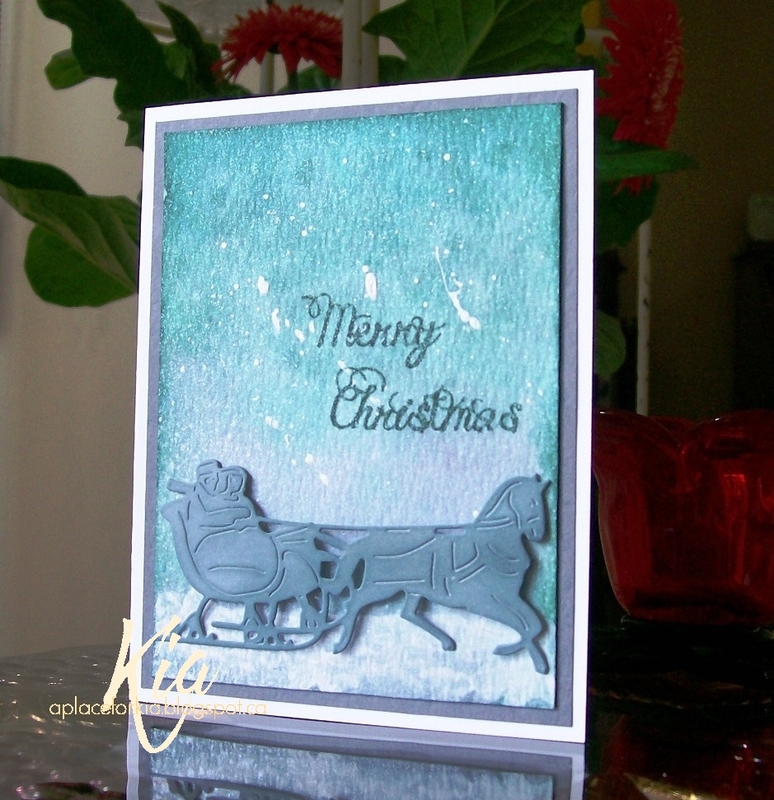 I heat embossed the die cut ribbon and the stamped "Christmas" sentiment with the silver. And, as I was having sequin withdrawals, I added a few cupped white sequins and some crystals to finish. I really like the end results, and hope you do as well. Thank you for visiting today. Products: Frantic Stamper Finial Ornament Background Die, Frantic Stamper Finial Ornaments Stamp Set, Frantic Stamper Merry and Bright, Watercolour Paper, Sheena Douglass Festive Evergreen Embossing Folder, Simon Says Stamp Stitched Rectangles. Another design using my Birch Land stamp set. I need several thank you cards, but I want them all to be a bit different. I used my MISTI to help set this card up. With the top panel on top of the card base I lined my card up with the grid pattern paper and placed my magnets accordingly. 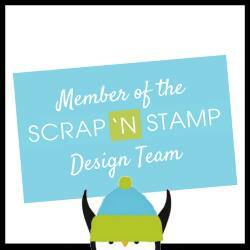 I use 110lb Neenah cardstock, so those magnets play an important role in keeping everything where I put it. I stamped the tree using Memento London Fog on the top panel, then removed it and stamped the tree on the card base. 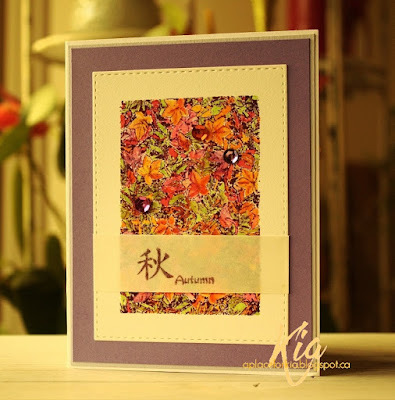 I have a mask of the tree from a previous card I did, so I put it in place and started stamping my leaves using my acrylic block as I was turning and using different colours as I went. I then placed the top panel on top along with my mask and continued the stamping. I wanted a bird that was flying so I went on the hunt through my stamps and found one from an October Afternoon stamp set that I have had for years. 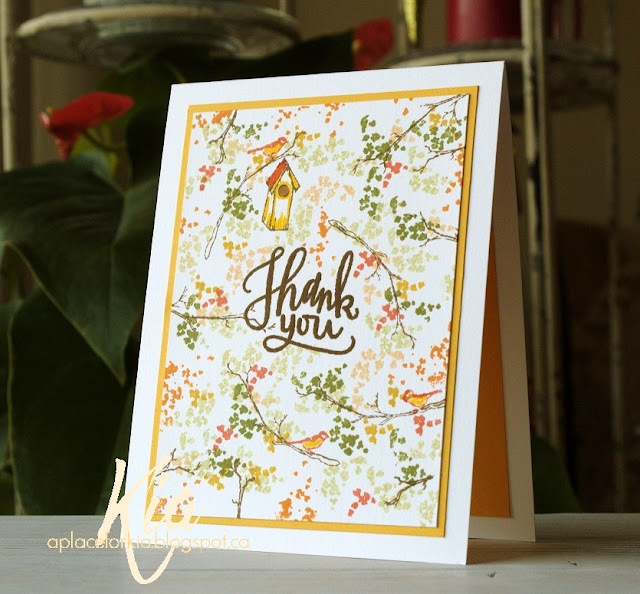 I placed it on the card front, found a thank you that I liked to add to my card front and picked them both up with my MISTI. I inked the bird with the base colour and inked the sentiment with the London Fog and stamped. I removed the sentiment, and added some of the deeper orange to the bird and stamped adding a bit more colour to the bird until I was happy. The top panel was attached to the card base on foam dots to finish and I am quite happy with the results. Thanks for having a look today. Products: MISTI, Altenew Birch Land Stamp Set, October Afternoon Detours (bird), Penny Black Illumination (sentiment), Memento London Fog Ink, Tim Holtz Distress Inks Shabby Shutters, Dried Marigold, Carved Pumpkin, Neenah 110lb Cardstock, Foam Strips. Playing with my Altenew Birch Land Stamp Set today. I stamped the branches in the centre keeping in mind that I wanted my thank you sentiment to be the focal. So I used my MISTI to assist with the placement of my thank you and stamped around that. Once the branches were complete I added the leaves in different colours, as we are coming in to Fall. I added a bird house, which I painted with Zig Brushes, and 3 birds, also painted with the Zigs. I then closed the cover of my Misti and picked up the thank you, inking in Gathered Twigs and stamped. I had to do it several times to get good coverage. Thanks for having a look. Products: MISTI, Altenew Birch Land, Simon Says Stamp Big Scripty Greetings, Tim Holtz Distress Inks Gathered Twigs, Peeled, Shabby Shutters, Dried Marigold, Carved Pumpkin. Making a few things that will be needed for Christmas, as gifts. 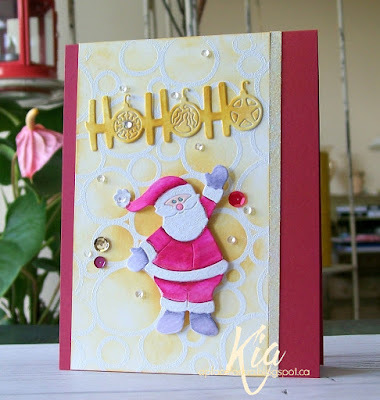 I made these with a few of the dies from the Frantic Stamper Christmas release. The candle has a matching gift tag for a friend of mine, and a couple of other gift tag ideas. I will be making more tags to give away and will share them at a later date. and attached it to my card on foam dots. 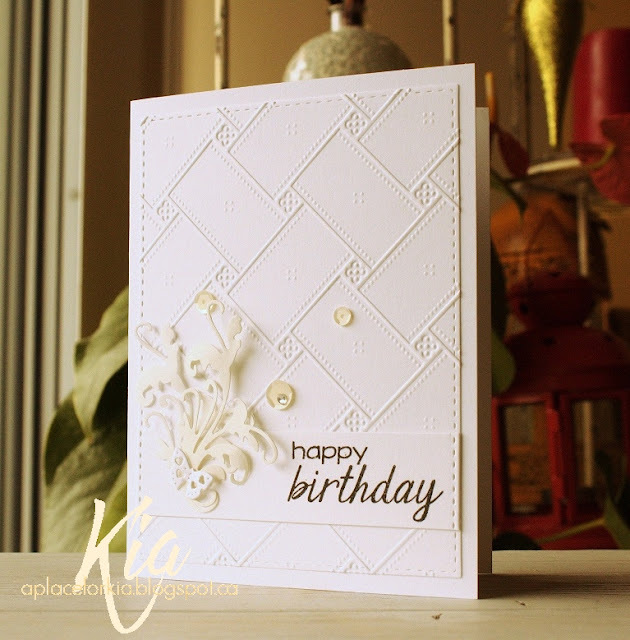 For this card I stamped my background and heat embossed with white embossing powder. 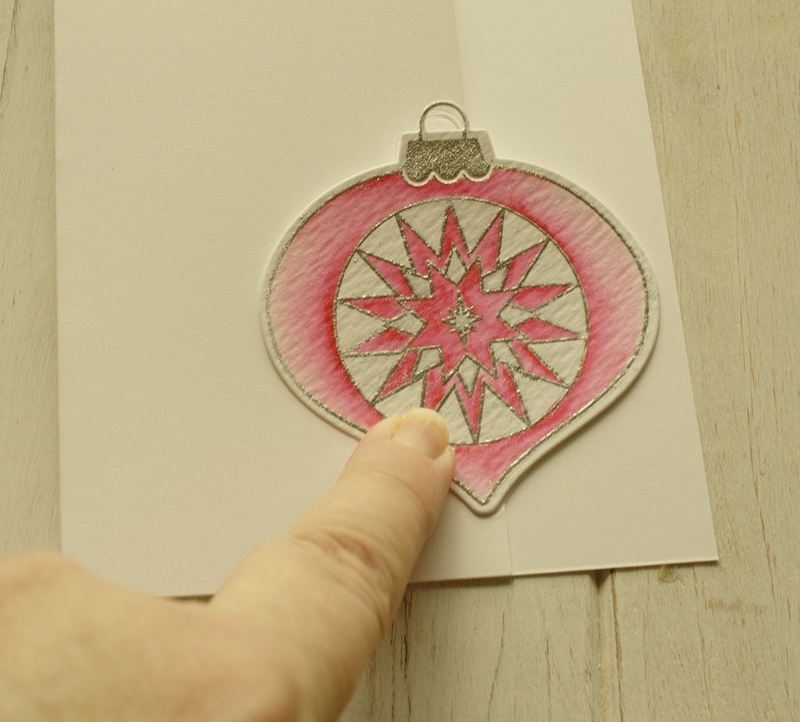 I die cut the Joy and the Stars from white glitter paper for a simple Christmas Greeting. 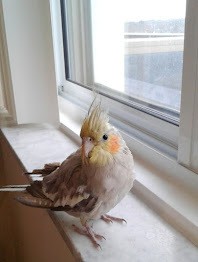 It is very soft and I think very pretty. Products: Frantic Stamper Victorian Sleigh Ride, Frantic Stamper Finial Ornaments Stamp Set, Frantic Stamper Joy Die, Frantic Stamper Reverse Cut Stitched Country Stars, Marianne Designs Background Snowflake Stamp, Tim Holtz Distress Inks, Acrylic Paint. I wanted to try this technique for some time. I picked pink and red geraniums to try it out, which entailed running the flowers through your Cuttlebug on watercolour paper. I did several different ones, and for a few I added a spritz of water. The flower above is a pink geranium with no water added. I love the soft look. When stamping my sentiment, I used my MISTI to ensure my stamp was in the correct place and to ensure I could ink my stamp several times, as I was stamping on watercolour paper. For the sentiment I used Tim Holtz Distress Ink Peeled Paint, and attached my piece to complimentary matting and then to my embossed card base. This is a close up view of my flower stamping. I gave this card to our gardener as I think she would love it. Products: MISTI, Pink Fresh Geraniums, Fabriano Watercolour Paper, Neenah Cardstock, Simon Says Stamp Stitched Rectangles, Taylored Expressions Leafy Vine, Stamplorations Noteworthy, Sequins, Tim Holtz Distress Ink. Joy to the World, another card I did for Frantic Stampers Christmas release. 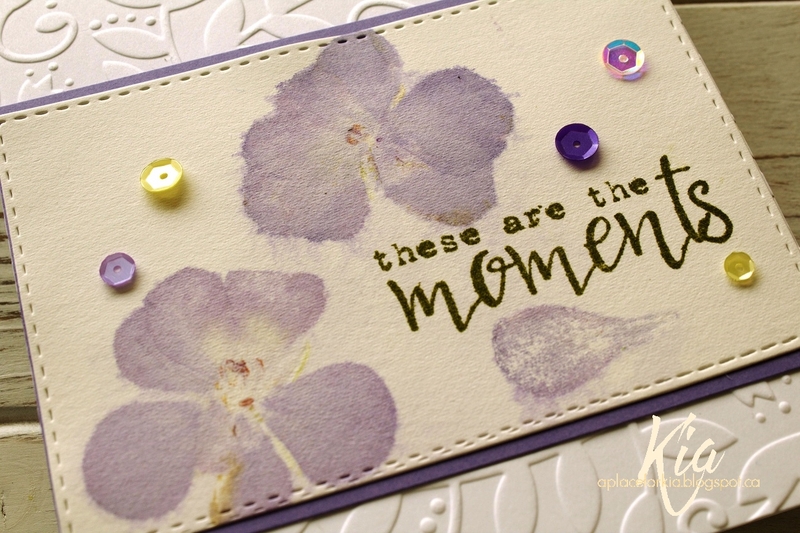 I stamped the sentiment using my Misti for placement. 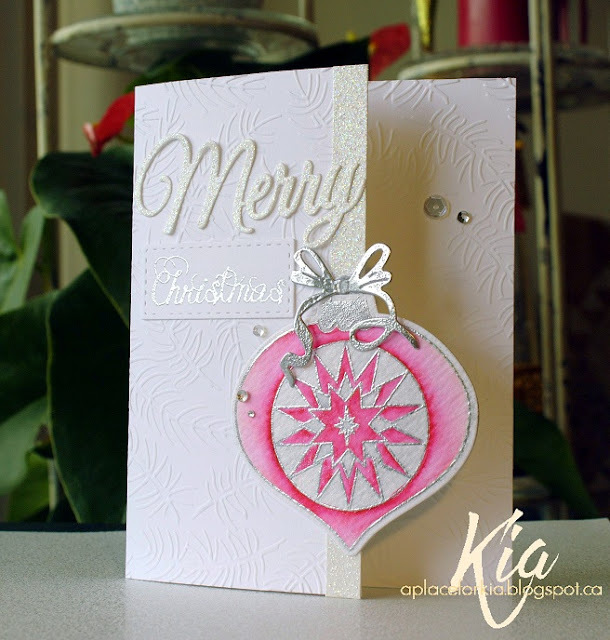 I then embossed the background with my snow dots embossing folder and applied some Wink of Stella Brush to some of the dots. I coloured the Victorian Carolers with Zig Brushes and attached on foam dots. I very much like how this card turned out. Thanks for having a look today. 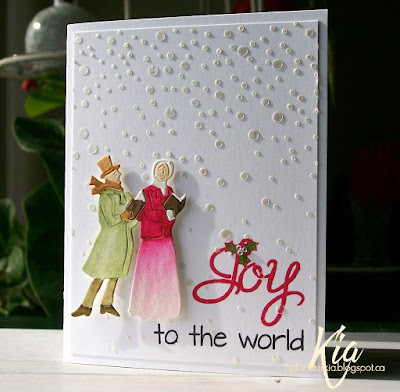 Products: Frantic Stamper Victorian Carolers, Frantic Stamper Joy and Peace, Sizzix Snow Dots Embossing Folder, Wink of Stella Brushes. I started with the background. 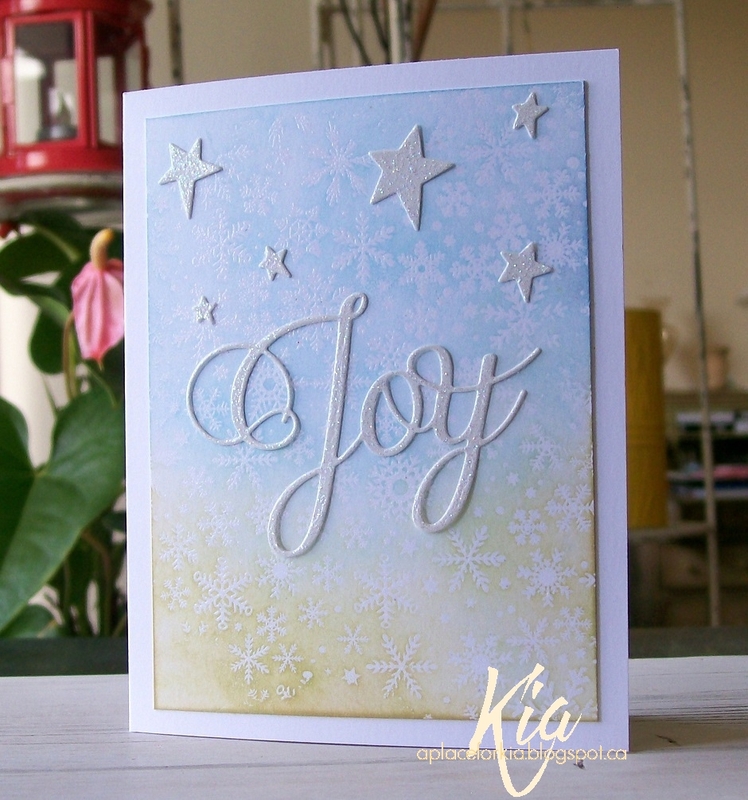 For texture and a look reminding me of snow, I stamped using the circles and heat embossing with white embossing powder. I then sponged on some Tim Holtz Fossilized Amber behind where Santa would stand, and attached to my red card base. I cut Santa out with watercolour paper and painted his suit with Zig brushes and the trim with a white gel pen, then attached using foam dots. I applied a thin strip of winter white glitter paper to the edge and the HoHoHo sentiment which I sponged with the amber ink. A splattering of sequins and crystals finished my card. I hope you like Santa, and thank you for visiting. Products: Frantic Stamper Reaching Santa, Frantic Stamper HoHoHo, Simon Says Stamp Stepping Stones, Tim Holtz Fossilized Amber Distress Ink, Zig Brushes, White Gel Pen, Sequins.